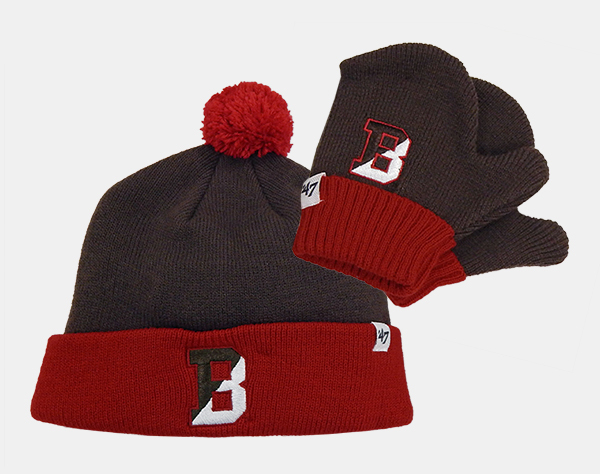 47 Brand Toddler 100% acrylic brown knit cap with cardinal lining and cuff and cardinal pom. Embroidered half-brown, half-white 'B' with cardinal embroidered outline on cuff. Toddler 100% acrylic brown knit mittens with cardinal cuff has embroidered half-brown, half-white 'B' with cardinal embroidered outline. Creative Knitwear 100% cotton. 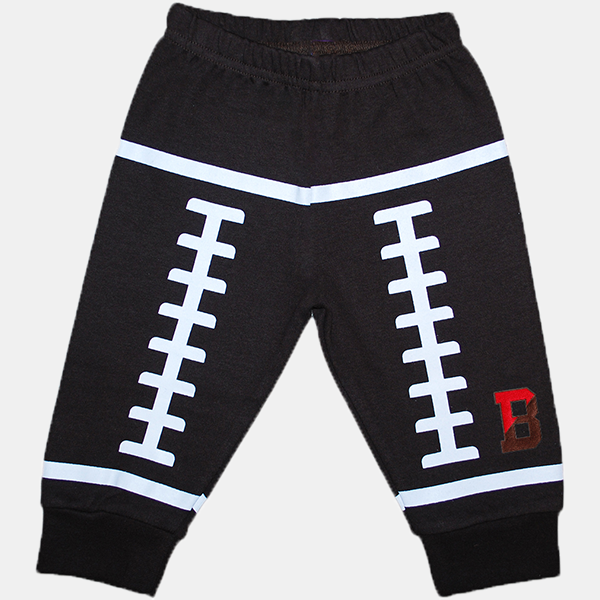 Brown sweatpants with football laces designs at waist, down legs, and at ankles. Split 'B' embroidered in brown and red with brown outline near ankle of left leg. Please select option for CK Brown Football Pants - $20.99. Creative Knitwear 65% cotton, 35% polyester. Grey sweatshirt with button snaps and hood. Crest embroidered in black, grey, white, cardinal, and gold on left chest above 'BROWN' embroidered in white lettering with black outline. Please select option for CK Grey Hooded Sweatshirt - $24.99. Creative Knitwear 65% cotton, 35% polyester. Grey elastic sweatpants featuring embroidered Crest in cardinal, grey, black, white, and gold above 'BROWN' embroidered in white lettering with black outline at base of left leg. Please select option for CK Grey Sweat Pants - $18.99. Creative Knitwear 70% cotton, 30% polyester. Stretchy waistband jeans with pockets on back. 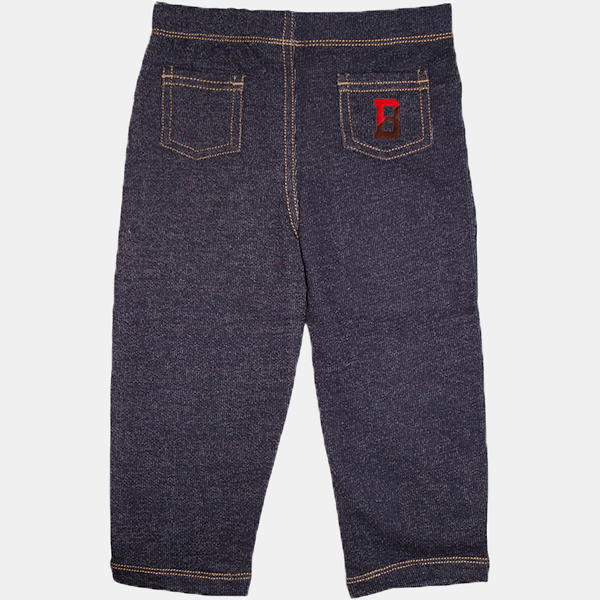 Right pocket features embroidered split 'B' in brown and red with brown outline. Please select option for CK Stretch Jeans with Split 'B' - $26.99. Creative Knitwear 100% cotton, brown and white striped toddler long-sleeve tee with brown trim at neck and end of sleeves, and brown pocket on upper-left chest. Grey, cardinal, black, white, and gold embroidered Crest above 'BROWN' embroidered in white with black outline on brown pocket on upper-left chest. Please select option for TOD - CK Toddler Brown & White Striped Long-Sleeve Tee. Creative Knitwear 100% cotton, two-button, brown cable knit toddler sweater dress with cap sleeves. 'BROWN' embroidered in white with black outline on upper-left chest. Please select option for TOD - CK Toddler Brown Cable Knit Sweater Dress - $35.99. Creative Knitwear 65% cotton, 35% polyester, snap closure, brown hooded toddler jacket with ribbed trim at end of sleeves and bottom. Grey, cardinal, black, white, and gold embroidered Crest patch above 'BROWN' embroidered in white with black outline on upper left chest. Please select option for TOD - CK Toddler Brown Crest Snap Hooded Sweatshirt - $27.99. Creative Knitwear 100% polyester, brown fleece toddler beanie with velcro chin strap. Embroidered brown 'B' with white and black outlines entwined with green ivy with white and black outlines. Creative Knitwear 60% cotton, 40% polyester, brown toddler sweatshirt with embroidered brown Paw on white background and cardinal outline. 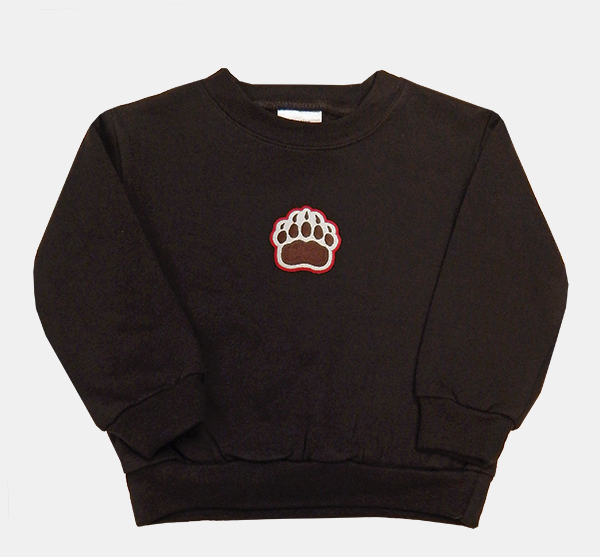 Please select option for TOD - CK Toddler Brown Paw Sweatshirt - $20.99. 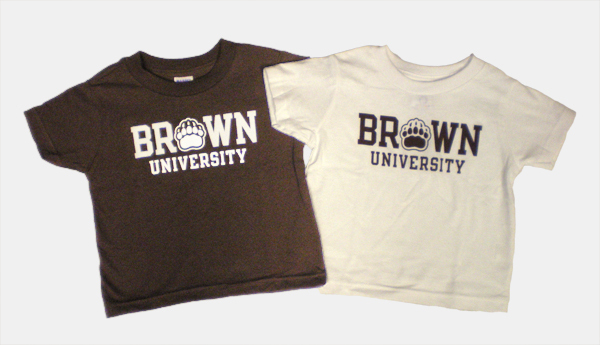 ES Sports 100% cotton short-sleeve toddler tee has 'BROWN UNIVERSITY' imprinted with Paw print replacing the 'O' in Brown. Note: Available colors: Pink Raspberry and Brown. White currently out of stock. Please select option for TOD - ESS Toddler Paw Tee - $18.99.